Easy to wear, comfortable and elegant: This is the Haqihana Harness. Made by hand with materials all produced in Europe, it is the ideal equipment to ensure maximum comfort for your dog without causing pain, a sense of constriction, rubbing or any other discomfort. It has 5 adjustable points made with safety stitching and all plastic components are rounded and free from sharp corners. The ML, SL, XSL and XXSL variants have longer longitudinal elements (back and abdomen), suitable for long dogs. Variable belt width (15mm, 20mm or 25mm) depending on the size. International scientific literature inspired Haqihana to propose a substitute to the collar and halti, which is often a painful source of physical and psychological problems for the dog. Haqihana present a non-inhibitive type of harness - it is hand made paying great attention to detail, with safety and comfort paramount for the dog. The harness does not cause pain, friction or injury to the skin and does not limit movement in any way or create any other discomfort. The two buckles make putting on and removing the harness a breeze for both dog and owner. Colours Available: Artic, Black, Blue, Chocolate, Gold, Green, Multicolour, Orange, Steel, Turquoise, Violet, Wine. 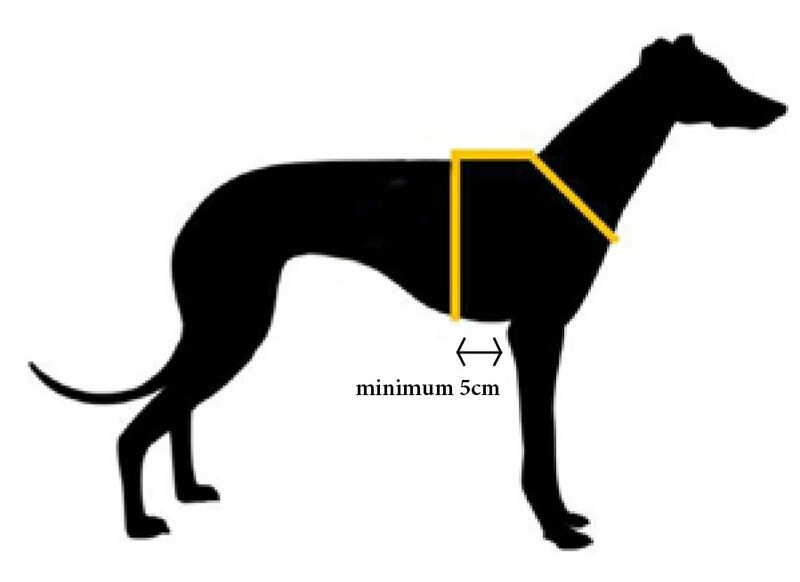 As an approximation and general guide only, to measure most dogs for a Haqihana harness, measure around your dog's girth at the widest part allowing at least 5cms from the back of the front legs (see picture). The long harnesses contain longitudinal segments (back and abdomen) longer for long-dogs conformation. Design, together with well-proportioned dimensions and positioning of the harness on the dog have been carefully studied to guarantee maximum comfort in all situations. Pressure is properly distributed on the dogs sternum and thorax only, even when the dog is pulling, jerking or being restrained. The harness does not cause pain, sense of restriction, friction or injury to the skin, and does not limit movement or create other discomfort. The two buckles and their position make putting on and removing the harness trouble-free for dog and owner. The carefully studied sizes and the five point adjustment guarantees optimal wearability and adaptability of the harness for all dog sizes and morphology. The harnesses are hand-made paying great attention to detail. In fact safety and comfort for the dog are very important. All parts are sewn together with secure stitching and the overlapping parts, which have contact with the skin, are finished with a special stitching to avoid any rubbing, particularly in the short-haired dog. The webbing is made with high tenacity spun-dyed nylon-6 which guarantees colour homogeneity and resistance. The special characteristics of nylon (polyamide) make it particularly suitable for a harness and leash production. In fact, amongst synthetic fibbers nylon is well known for its softness, optimal strength-to-weight ratio, abrasion resistance and chemical and biological stability. Finally, it is fully recyclable. The webbing is made in Italy to Haqhiana design. The buckles and adjusters are made from acetal resin which maintains long lasting mechanical and shock resistance even in extreme conditions. The plastic parts are rounded off and have no sharp edges in order to ensure the dogs comfort. The metal components are in stainless steel (AISI 304) which does not release Nickel or cause allergic reactions in accordance with European regulations. The guarantee covers the harness for 5 years from purchase date – with repair or replacement - against all faults, breakage or that which is not considered normal wear and tear. Haqihana reserves the right to verify the correct use of the harness. (For example, chewing, failing to follow washing instructions or unauthorized modifications and repairs is considered incorrect usage). In order to take advantage of the guarantee, the warranty card must be provided duly filled out, stamped and dated. It is therefore recommended to keep the product tag in a secure place. Haqhiana also provides a repair service for a fee in all other cases where the repair is technically possible.